Would one get shocked by from hot case by pure Grounding Electrode Only? Thread: Would one get shocked by from hot case by pure Grounding Electrode Only? We recently had a very similar situation where there was no grounded conductor or equipment ground at the equipment. Ground rod only. Measured voltage from rod to screwdriver stuck into the earth 6’ away was about 90 volts. Bolted fault to one of the phases. No, it was 120/240 single phase. No EG was run with the 240 v lighting circuits to poles. The voltage gradient in the soil above assumes the street light pole metal enclosure and ground rod is same location. But how about if the metal enclosure (like panel enclosure below) and ground rod distance differs. Where will you draw the gradient circles below.. in the center of the ground rod or the panel case? I'd like to understand what gradients (just qualitatively) the person feet are exposed to. Using the gradients in the upper picture, how far away from the ground rod is your stick figure? The gradient will will be different at your house than mine. It most likely will be different than the guy with two rods versus your one. Dry sand vs wet clay? Is is he standing on concrete in direct contact with the soil or does it have two inches of insulation under it as mine does? 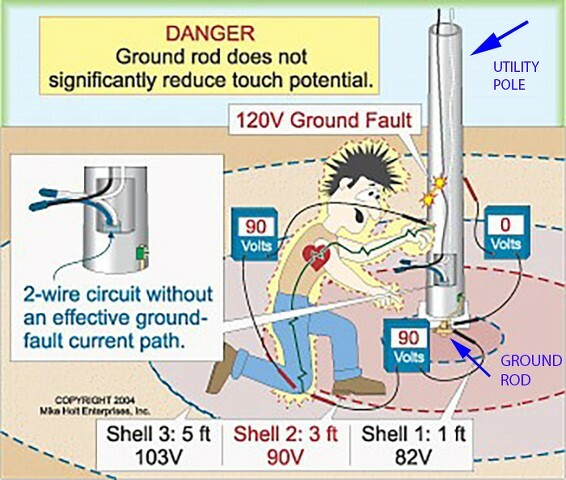 The person is say 10 meters away (32 feet) from local electrode ground rod (the panel is also 10 meters away from ground rod). Let's assume the person stands on bare feet and dry sand. So I guess the gradient concentric circle starts at the local electrode ground rod (you can make it two rods.. I just want to know where to start the gradients circle and if the person would be shocked)? I’ve never done the testing so keep that in mind. IMO. The gradients shown in the illustrations are not static. They will change from day to day and possibly hour to hour. Totally dry sand may not allow enough current to flow, while working your feet down three inches could be an eye opener. Being shocked is also subjective. We can’t tell you that at exactly 32 feet you will feel a shock or how strong you judge it to be. Do you run Marathons in your bare feet or haven’t had your shoes off outside in 30 years. How old are you? Male, Female? IDK what transgender will do to that. 1. At the ground rod. 2. Since you mentioned "bare feet", probably, keeping in mind all the caveats ptonsparky mentioned. The gradients stay pretty much the same. They are based on percentages of the total soil resistance, and assume that 100% of the voltage is dropped within x' of the grounding electrode. I think most such tables assume 100% drop at 25-50 feet from the rod. All a lower soil resistivity does is increase the current from into the earth. The voltage drop at x' remains relatively constant for various soil sensitivities. Panel and rod are at same potential because there is a bond conductor between them, disregarding any voltage drop on that bond conductor which will be negligible anyway if it is short length, so that leaves you with how far are you from the rod where you are contacting earth will determine what voltage you are subjected to. If the panel were mounted on a conductive/semi conductive surface, there may be additional voltage gradient zones present relative to that surface. What does NEC and other codes say about this, and theoretical considerations? In a nutshell, the NEC requires a low impedance path back to source to trip the OCPD.